Welcome to a new family surf adventure! 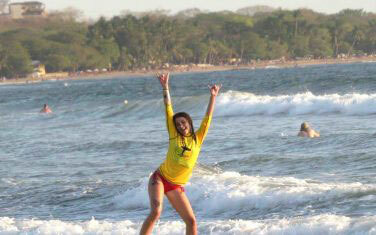 Ready for your Tamarindo family surf lesson? Here we go! Hop aboard Enrique’s boat for a short water-taxi ride to another world. You are officially on your way to your Frijoles Locos Family Surf Lesson. Glide up the Tamarindo Estuary keeping an eye out for birds, monkeys, and crocodiles. Peek carefully into the mangroves, and keep your eyes scanning the riverbanks. You never know what you will see as you are transported away from the hustle and bustle of Tamarindo, to the small, quiet community of Playa Grande. Created with adventurous Tamarindo family visitors in mind, our Playa Grande surf lesson package is right for you if you are the kind of family who likes to do things a little different! Once you have made your reservation, and have a confirmation, simply walk down the beach of Tamarindo, until you reach the ‘pangas’. Pangas are the name locals give to small boats. You will see the collection of boats that are on standby to take willing beach-walkers across the river. Here, Enrique (the boat captain) will meet you and take you 5-10 minutes up the river to Hotel Bula Bula, where your surf instructor and guide from Frijoles Locos Surf School will await you. From Hotel Bula Bula, you will jump in the Frijoles Locos surf-mobile and be driven to the most suitable part of the beach for learning to surf. Enjoy your 90-minute surf lesson away from the crowds and a far-cry from the hoards of other surf schools. Focus on learning, safety and fun. Book now! We look forward to treating you to a phenomenal surf lesson, and the full Playa Grande experience. We offer clients who stay in Tamarindo a special package where you catch a small boat taxi across the estuary from Tamarindo to Playa Grande (to a hotel called Hotel Bula Bula). Private lessons (from Tamarindo, by boat) Ideal for families! 90 minutes instruction time. Please allow at least 2- 3 hours out of your day for this option, in case you wish to visit our surf shop and take a shower/ see more of Playa Grande. Board and rash-guard included for lesson duration. Personalized instruction with one instructor just for your group. 1 instructor can teach up to 4 students. Flexible attendance…same price for 1 up to 4, in case people drop out or want to join on a whim. transportation from Hotel Bula Bula (meeting you from the boat), and within Playa Grande included. Best for people who appreciate a custom experience, tailored to your level of surfing. Cost for this package is $145. The boat trip will take 5 minutes- then only a couple minutes to the surf spot. You can choose to drive from Tamarindo in your rental car, and park at our surf shop, however, it will take 25-30 minutes to drive, each way. The cost if you drive yourselves to Frijoles Locos Surf Shop is $120. In order to reserve, we request from you the following info. Please email to [email protected] or fill out the contact form down below. Desired Time: lessons are scheduled according to tides however, we will do our best to accommodate your request. Activity: Surf Lessons with Frijoles Locos at Playa Grande by boat from Tamarindo. Price: $145 for up to 4 people. – Boat transfer from Tamarindo to Hotel Bula Bula in Playa Grande and return included. – Transport from Hotel Bula Bula by vehicle to the beach for surfing included. – Transport within Playa Grande if desired, included. – Please help us keep Costa Rica beautiful and bring your own refillable water bottle. We do not supply water in single-use plastic bottles. – Leave all unnecessary valuables at your hotel, bring only what you will be using in the water, plus a towel and drink bottle. Cancellation Policy: All cancellations within 48 hours of scheduled activity will incur a full penalty fee.